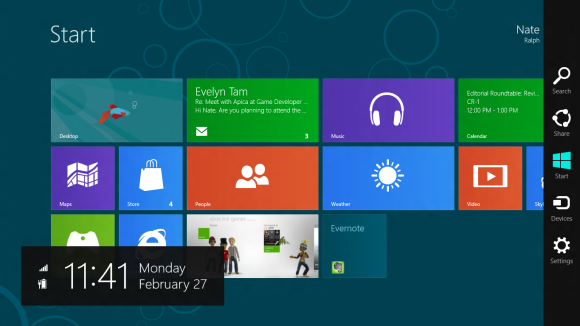 My, how time flies when you're swiping through live tiles. Microsoft's new-look Windows 8 launched exactly one month and one day ago, bringing its modern user interface and mobile-style apps to the desktop masses on October 26th. So how has the system actually fared during its honeymoon period? Read on for the full synopsis of Windows 8 wins and losses. It can't be all bad. Or can it? Stephen Sinofsky, former Windows division president. Many eyebrows were raised on November 12 when Microsoft announced that Stephen Sinofsky—the president of the Windows division, a driving force behind Windows 8, and a long-time leader at Microsoft—was leaving his post, effective immediately. The odd timing and abrupt announcement led to a rash of speculation. Was Sinofsky fired or did he quit? Was it planned? Are Windows 8 sales that bad? Neither Microsoft nor Sinofsky will talk about their divorce, but many analysts believe Sinofsky's penchant for secretiveness and territorial mindset alienated external and internal partners alike, which proved troublesome in the new, cross-departmental world of Windows 8. It's hard to believe Microsoft would dump Sinofsky over two weeks of (possibly) poor OS sales. Regardless of the reason behind the split, Sinofsky's exit was badly timed and led to a fresh wave of media focus on the negative aspects of Windows 8. "I think it was unwise to fire the head of the unit during the launch cycle and during the critical 4th quarter," says Rob Enderle, the president and principal analyst of the Enderle Group. "It was a dangerous distraction." Sinofsky's departure may have been a dangerous distraction, but headlines alone don't make or break an operating system. Indeed, sales figures define the bottom line, and Sinofksy has never been a household name. Nonetheless, the unceremonious exit of the Windows boss adds up to a net fail for Microsoft in the executive comings-and-goings department. 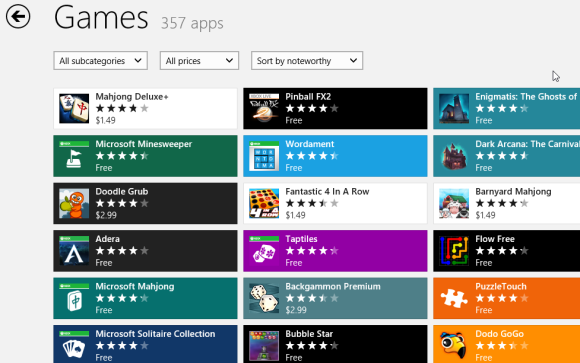 Windows 8 has a lot of games, but few standout apps. As the Windows Store goes, so goes Windows 8. The fancy-schmancy modern UI and its glittering live tiles are all powered by new-style Windows 8 apps, and the only way to get these apps is through the Windows Store itself. Our prelaunch examination of Microsoft's digital wares revealed a worrisome dearth of apps, along with a serious paucity of blockbuster apps, to boot. One month in, the Windows Store is looking a bit better. Wes Miller, an independent Microsoft analyst at Directions on Microsoft and the curator of the WinAppUpdate website, recently announced that the Windows Store finally cracked the 20,000 app barrier, with new apps showing up at a clip of roughly 500 per day, postlaunch. Only around 13,000 of these titles are available in the United States, however, and Microsoft still has a long way to go before it nears the 700,000-plus app selection of the entrenched Android and Apple markets. Still, the Windows Store is growing nicely. The quality level of those apps is still a concern, however. The last post on Miller's website is titled, "Windows Store: I'm holding out for a hero app," in which he bemoans the lack of exclusive Windows 8 apps and says flat-out, "There aren’t a ton of stellar apps." It's an observation that mirrors our own. Most of the available apps are ho-hum Web wrappers, uninspired utilities, or lackluster games. Sure, a few big-name apps have already reared their heads on Microsoft's platform. You'll find apps from Netflix, Hulu Plus, ESPN, Slacker, Kindle, SugarSync, Skype, Evernote, Amazon, Newegg, Angry Birds, and more. Dropbox and Twitter apps are in the works, albeit with no announced release dates. However, you won't find apps from big names like Facebook, YouTube, Gmail, IMDB, CNN, Pandora, Spotify, and hosts of others. Nevertheless, many user needs are now covered if you look hard enough, as evidenced by our Best Windows 8 Business Apps and Best Windows 8 Gaming Apps roundups. That need to dig deep, however, highlights another early woe for the Windows Store. Despite its nifty spotlight section, Microsoft simply doesn't do a great job of steering users toward standout apps, which will become a bigger and bigger problem as the Windows Store becomes more packed. "I think they need to do a better job of profiling so that they present apps they know I will like, similar to what Amazon does in their online store," Enderle says. "It amazes me how much better Amazon is than any of the app stores at this." While the Windows Store hasn't impressed anyone with either its inventory quantity or quality, it does deserve kudos for remaining on a steady, uphill climb. We'll refrain from issuing a failing grade in this category, and simply give the Windows Store an "incomplete." The new interface: charming or chilling? Swiping from the right, as it turns out, doesn't work like a charm. Aside from the app selection, many early criticisms targeted the modern UI itself, which throws everything you know about navigating Windows, well, out the window. Early adopters—especially nontechie types—have reported running into issues with the overhauled interface, which is made worse by Windows 8's near-complete lack of instructions when you boot it up for the first time. The complaints led us to question interface experts, who universally panned the dual-natured design of Windows 8. The complaints came to a head when usability guru Jakob Nielsen published a scathing blog post deriding almost every aspect of Windows 8's design. His brutal examination was then reblogged far and wide. Nielsen blasted the flat, nonintuitive look and "low information density" of the modern UI. He derided the way Windows hides commands in off-screen menus, and its too-shifty live tiles. He ripped into overly similar gesture controls, and Microsoft's decision to display just a single Windows 8 app at a time. "The product ought to be renamed 'Microsoft Window'," he quipped. The dual desktop and modern UI in particular create cognitive problems for everyday users, Nielsen says. In his opinion, Microsoft made a big mistake in attempting to create a single operating for desktops and tablets alike, as the two have very different uses and form factors. Why didn't we start off with hard sales numbers? Simple: Microsoft hasn't been forthcoming with those numbers, and the company declined to comment for this article. That institutional reticence makes it hard to divine just how well Windows 8 is actually selling on the streets. All that said, sporadic leaks, whispers, and data from third-party channels help us paint a partial picture of Windows 8's sales success—and what we've gleaned suggests that the OS is stumbling out of the gate.